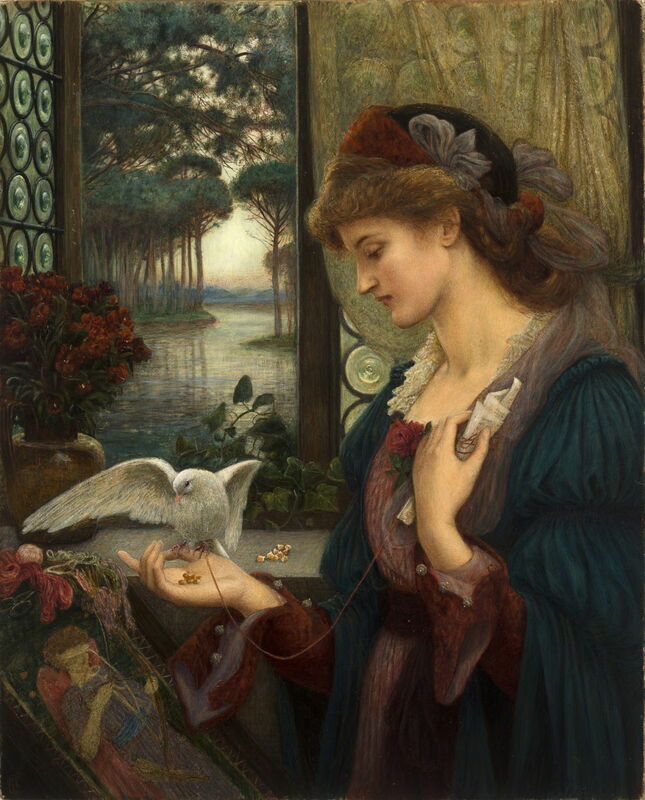 Marie Spartali Stillman (1844–1927), Love's Messenger (1885), watercolor, tempera and gold paint on paper mounted on wood, 81.3 × 66 cm, Delaware Art Museum, Wilmington, DE. Wikimedia Commons. 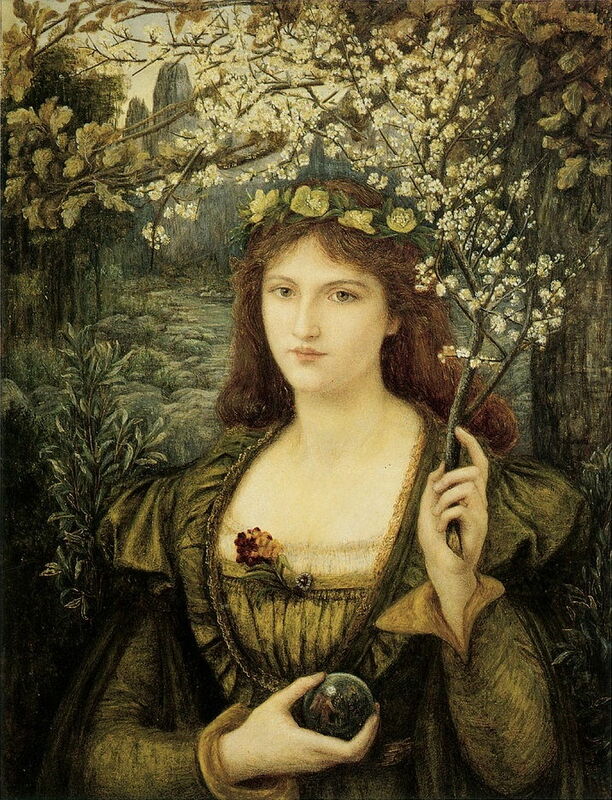 In the first article, I gave an account of the early life and work of Marie Spartali Stillman (1844–1927), up to her return to England after five years in Florence, in 1883. During that period she had made good advantage of her time in northern Italy, which had brought a maturity to her technique and style of painting. However, even with several substantial periods spent back in England, it had been hard for her to progress her own career and standing in her home market. For convenience, I start with three works which could of course be from much earlier or later. 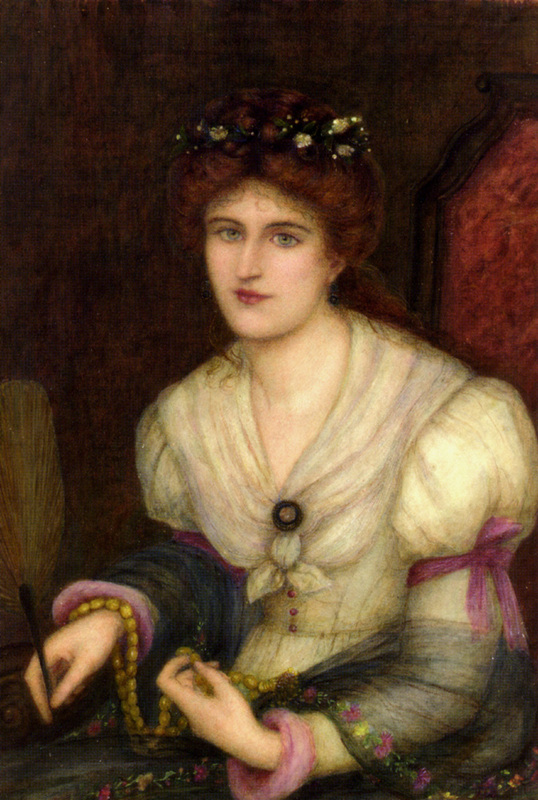 Marie Spartali Stillman (1844–1927), Self-portrait (date not known), watercolor and heightening with pencil, 69.8 × 52.1 cm, Private collection. Wikimedia Commons. This undated watercolour Self-portrait appears unrelated to her earlier (1871, 1874) self-portraits, and has a slight gaucheness in the eyes and mouth which suggests that, if it really is hers, it may be from before 1871. The fan she is holding is not the folding fan in those other paintings, and the flowers appear to have been painted in watercolour rather than gouache. 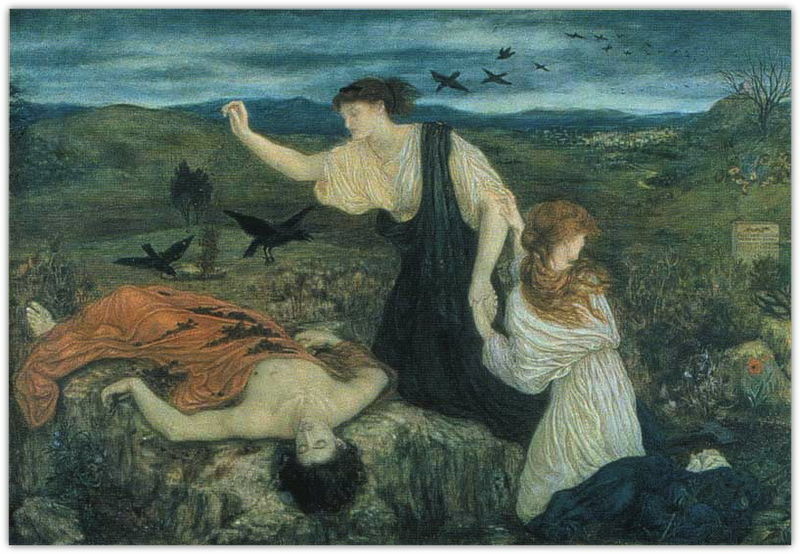 Marie Spartali Stillman (1844–1927), Antigone Giving Burial Rites to the Body of Her Brother Polynices (date not known), oil on canvas, further details not known. Wikimedia Commons. Antigone Giving Burial Rites to the Body of Her Brother Polynices is much more interesting, as it was painted in oils. Marie’s letters of 1883 record that she was then learning Burne-Jones’s technique of oil-painting, and that year and the next she purchased oil paints and ancillaries from her suppliers, Robersons. This may have followed her involvement in Burne-Jones’s The Mill (1882) – covered in the previous article – and this oil painting was then made slightly later. Polynices and Eteocles, the sons of Oedipus, quarrelled over which should rule Thebes, leading to their deaths. King Creon, who succeeded them, decreed that Polynices was neither to be mourned nor buried, on pain of death by stoning. Polynices’ sister, Antigone, defied the order and was caught. Here Marie Stillman shows Antigone (centre) attending to the burial of her brother, her companion fearfully trying to draw her away. They are greeted by carrion crows, and at the far right is the headstone of a grave. It is possible that Marie painted this in late 1884, as a response to her own sister’s death (below). Marie Spartali Stillman (1844–1927), Autumn (date not known), watercolor and bodycolour, 38 × 28.5 cm, location not known. Wikimedia Commons. Her Autumn appears to be a simpler watercolour, and may date from her early years. It shows a pensive girl harvesting apples, against a background of corn stooks in a cornfield. Marie Spartali Stillman (1844–1927), Madonna Pietra degli Scrovigni (1884), watercolor, and gouache on paper, 78.7 × 61 cm, Walker Art Gallery, Liverpool, England. Wikimedia Commons. Madonna Pietra degli Scrovigni (1884) was one of her first major works after her return to England, and was exhibited at the Grosvenor Gallery in the summer of 1884. It was accompanied by a translation of the poem (a sestina) by Dante of the same title, describing a woman who is as cold as stone in a wintry landscape. 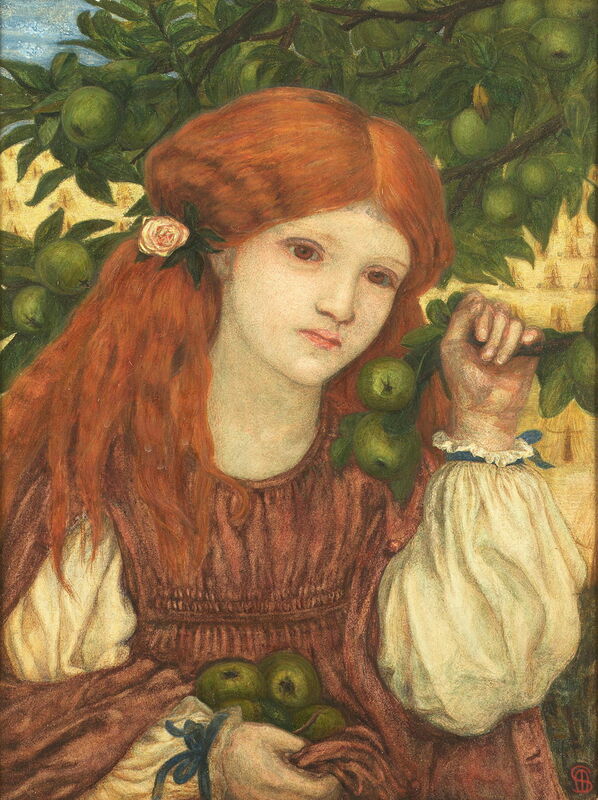 The painting’s symbols not only reflect the details of the poem, but may form homage to Dante Gabriel Rossetti, who had died two years earlier. That September, though, her own family problems became dominant. First her sister, Christina, died apparently as the result of a drug overdose, leaving teenage sons. Then the following year her father’s business went onto the rocks, he had to petition for bankruptcy, and the family mansion on Clapham Common was sold, with all its contents. Thankfully her parents did manage to keep at least one of their properties on the Isle of Wight, the lovely Rylstone Manor in Shanklin. Marie’s step-children were a relief from these problems: Bella had started training as a sculptor, and Lisa studied at the Slade School of Fine Art in London, and was a pupil of George Frederic Watts, who had long been a friend. Love’s Messenger (1885) is considered to be the finest of her single-figure paintings, and was her most successful ‘problem picture’. I have discussed such problem pictures in another article, suffice it to say that they started to appear around 1850, and were at their most popular between 1895 and 1914. The woman stands by her embroidery at an outside window. On her right hand is a messenger dove/pigeon, to which a letter is attached. She clutches that letter to her breast with her left hand, implying that its contents relate to matters of the heart. 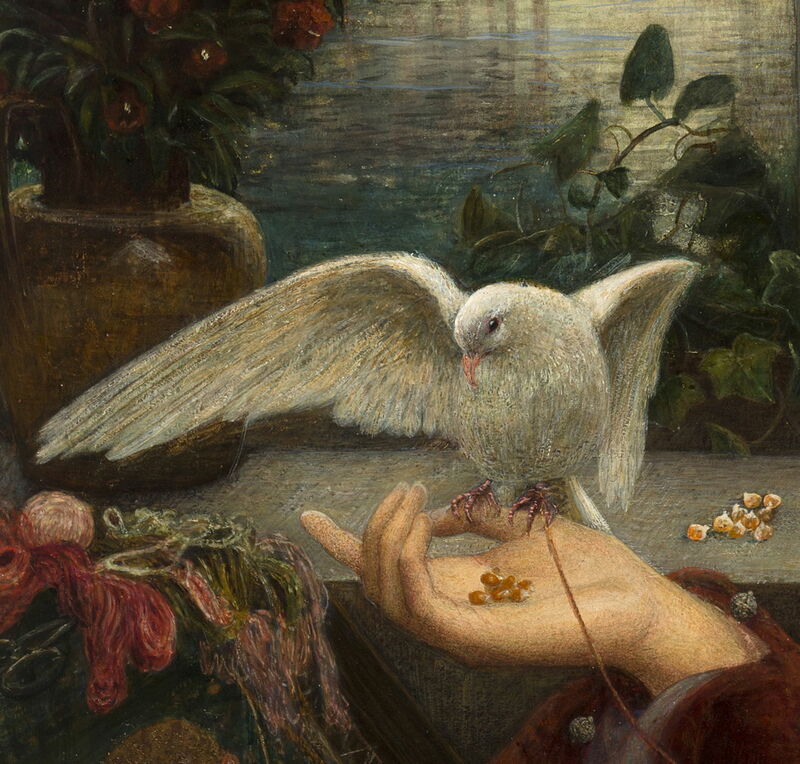 The dove is being fed corn, which could either be its reward for having reached its destination (thus the woman is the recipient of the message), or preparation for its departure (she is the sender). On balance, the presence of corn on the windowsill implies that it is more likely that the dove has just arrived, and the woman is the recipient. These clues are accompanied by alternative interpretations of the other objects and symbols, such as the embroidery. Despite being exhibited at the Grosvenor Gallery in 1885, and elsewhere, this painting did not sell until after Marie had reworked the background in the 1890s. In 1901, it was snapped up by a US collector, and has been in the US ever since. Marie Spartali Stillman (1844–1927), Love’s Messenger (detail) (1885), watercolor, tempera and gold paint on paper mounted on wood, 81.3 × 66 cm, Delaware Art Museum, Wilmington, DE. Wikimedia Commons. A detail view of Love’s Messenger shows how Marie’s watercolour technique results in a facture more closely resembling that of oils, although this painting is an extreme example with its use of tempera too. This was accomplished by using transparent watercolours more like oil glazes, and gouache (opaque watercolour) for details. Although this is unusual, I do not believe that this is as unique as has been claimed. In 1886, William Stillman was sent out to Italy again, this time to Rome, as its correspondent for The Times newspaper. The family followed him, allowing Marie to make friends with Giovanni Costa, a noted landscape painter of the day. Costa took young Lisa under his wing, and mother and step-daughter exhibited with his Etruscan School, and the group of notable British artists under the banner of In Arte Libertas (which included Watts, Burne-Jones, and Frederic Lord Leighton). 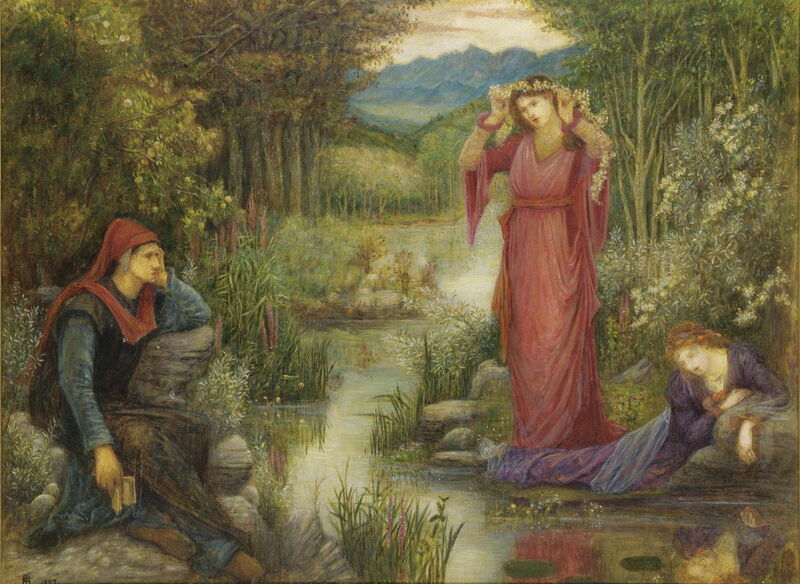 Marie Spartali Stillman (1844–1927), Dante’s Vision of Leah and Rachel (1887), watercolour, 36.5 × 49 cm, location not known. Wikimedia Commons. In Dante’s Vision of Leah and Rachel (1887), Marie returns to her favourite Florentine author, and references Canto 27 of Purgatory, in his Divine Comedy. Here, Dante is on the Seventh Terrace, representing the sin of lust. Just before the dawn of the Wednesday morning, when Dante and Virgil are sleeping on the steps between that terrace and Earthly Paradise, Dante experiences his third dream, a vision of Leah and Rachel. They are symbols of the active (lay) and contemplative (monastic) Christian traditions. Marie shows this fairly true to Dante’s verse, with the poet sat at the left, wearing his customary red chaperon, Leah in red, standing fashioning a garland of flowers for her head, and Rachel, as ever staring at her beauty in reflection. The whole is set in a northern Italian landscape, rising to the southern edge of the Alps in the far distance. Marie Spartali Stillman (1844–1927), Dante at Verona (1888), watercolour and gouache on paper, 49.5 × 73.7 cm, Private collection. Wikimedia Commons. She kept with Dante in the following painting, Dante at Verona (1888), one of three related works which she submitted for the inaugural exhibition of the New Gallery, which succeeded the Grosvenor Gallery that year. 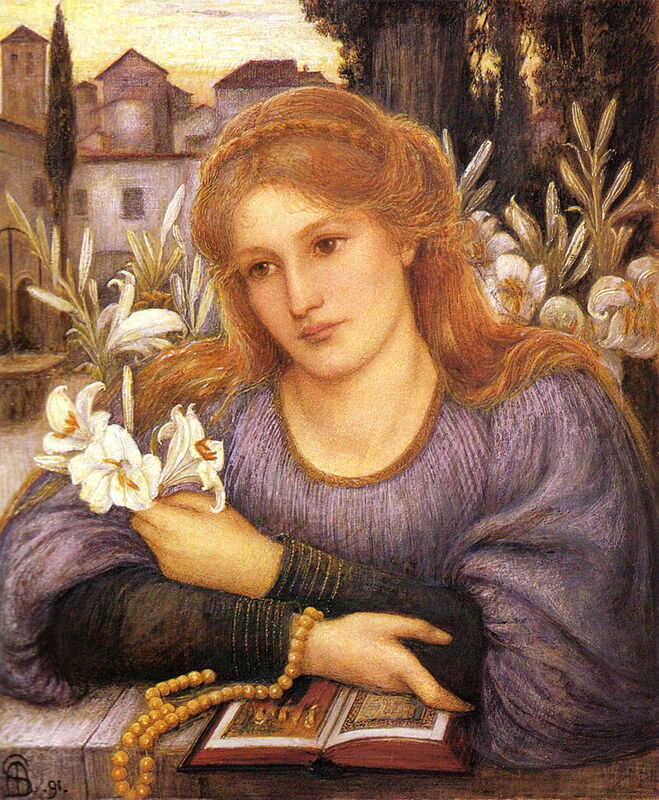 Now she was back in Italy, such themes were only to be expected, but she accompanied the painting with a quotation from Dante Gabriel Rossetti’s highly popular poem of the same title. This describes Dante’s exile from Florence to the court of Verona. Marie sets her version in the public garden in Verona, where “wearied damsels” request the poet to recite his early poem Vita Nuova. As previously, she takes the opportunity to reference three modes of art – poetry, music, and painting – and thereby evokes the Aesthetic, albeit in a Pre-Raphaelite mediaeval setting. 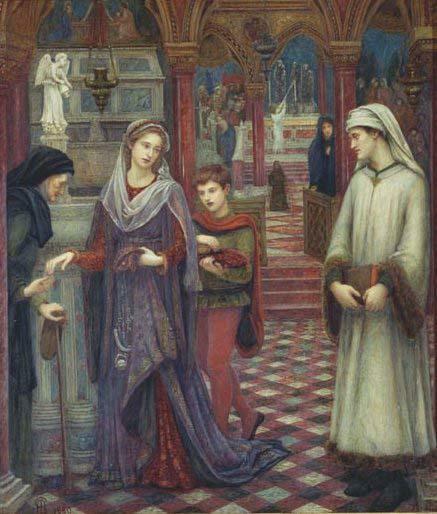 Marie Spartali Stillman (1844–1927), The First Meeting of Petrarch and Laura (1889), watercolor, gouache and graphite on paper, 56 × 48 cm, Private collection. Wikimedia Commons. In her The First Meeting of Petrarch and Laura (1889), Marie goes back to one of the influences over Dante, the Italian poet Francesco Petrarca (1304-1374), widely known as Petrarch, whose sonnets became a model for lyrical poetry through the Renaissance. After Petrarch had given up his vocation as a priest, he saw a woman known only as “Laura” in the church of Sainte-Claire d’Avignon. She was apparently very beautiful, already married, and refused him – although it is unclear whether Petrarch had any personal contact with her. It did though drive him to express his feelings in exclamatory love poems, and to condemn men who pursue women. Laura apparently died 21 years later, and Petrarch was consumed with grief. Petrarch is seen at the right, and Laura on the left, their looks and body-language following Petrarch’s account. Although the opportunities are limited in this story, Marie follows a Pre-Raphaelite rather than Aesthetic approach here. 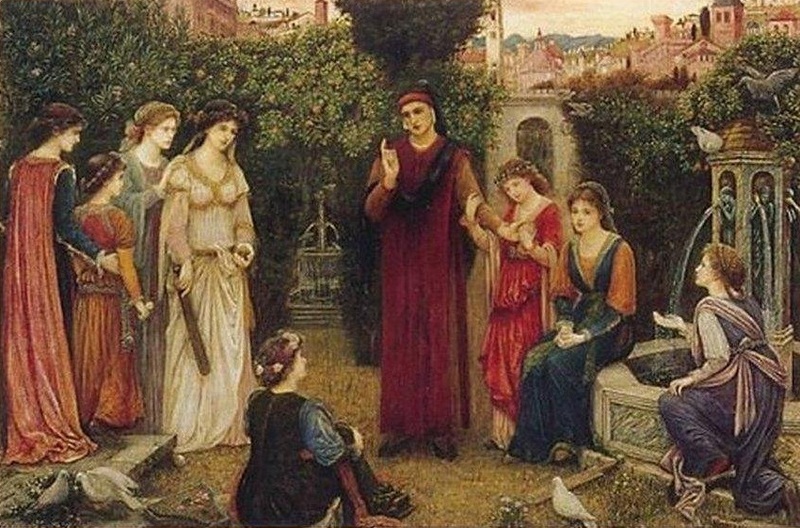 The Enchanted Garden of Messer Ansaldo (1889) draws on another classic of Italian literature, Boccaccio’s Decameron, and was exhibited with a written explanation of the scene. Ansaldo has been wooing Madonna Dianora, who tells him that if he could get flowers to bloom in the winter, then she would respond to his seduction. 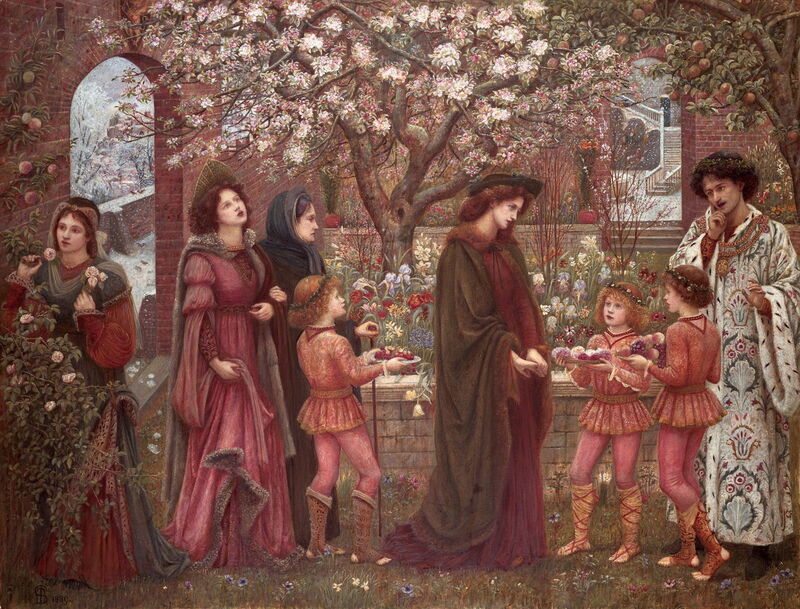 Here, surrounded by his enchanted blooming garden, and with snow on the ground outside, Ansaldo (at the right) has invited Dianora (just right of centre) and her entourage to see. Dianora is then torn between her honour as a married woman, and her promise. Marie painted this when in London, and exhibited it at the New Gallery later that year. Failing to sell it in the UK, she took it with her to the US in 1900, where it was bought in Boston by a distant relative of her husband. The painting then disappeared until it was re-discovered in the 1980s. It is therefore not clear whether it may have influenced JW Waterhouse, who painted a similar work in 1916-17. Marie Spartali Stillman (1844–1927), Cloister Lilies (1891), watercolour and gouache on paper, 45 x 36 cm, The Ashmolean Museum, Oxford. Wikimedia Commons. Cloister Lilies (1891) seems altogether plainer in its reading. A beautiful young woman rests in thought, holding lilies (symbols of purity), with beads (rosary, for prayer) and an illustrated book. Although this appears set within the walls of a convent (probably based on one in Florence), she is not (yet) a nun herself. When first exhibited at the New Gallery in 1892, though, it was accompanied by lines from Edward FitzGerald’s popular translation of the Rubáiyát of Omar Khayyám – hardly a model for the contemplative life of a nun – which lament the passing of beauty and youth. 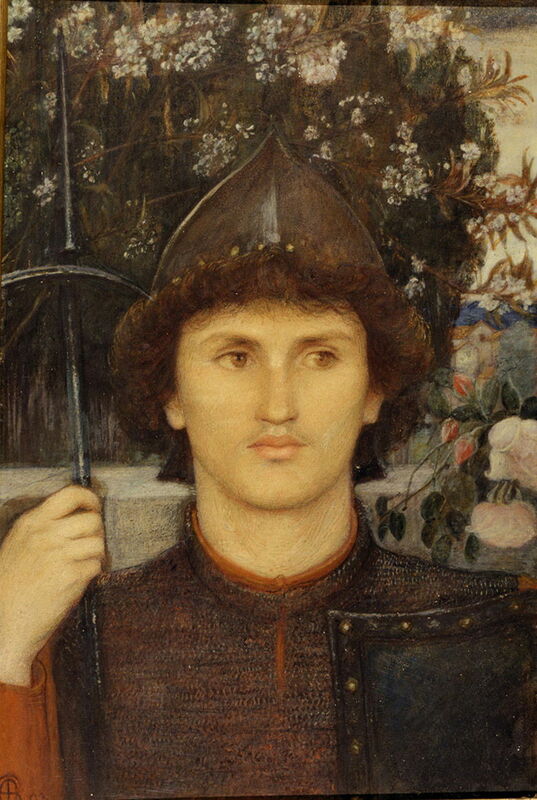 Marie Spartali Stillman (1844–1927), Saint George (1892), watercolor on paper, 46 × 30.8 cm, Delaware Art Museum, Wilmington, DE. Wikimedia Commons. Marie became even more enigmatic in her treatment of the hugely popular theme of Saint George (1892) – long tackled through his hagiographic achievement of killing a dragon. What she appears to have done is to ignore that established if not ingrained tradition, and painted an icon of him, poised with lance and shield. Sadly I have no further details of any accompanying references which might have explained this approach. I will complete my brief sampling of her works in the next article in this series. Posted in General, Painting and tagged Boccaccio, Dante, history of painting, Morris, painting, Petrarch, Pre-Raphaelite, Rossetti, Spartali, Stillman, watercolour, women in art. Bookmark the permalink.